You may remember that in my How To Be Content With Your Kitchen post, I wrote about how much I love my sliding kitchen cabinet shelves. Well, that very night, we were in the living room and heard a mysterious crashing sound. We looked all around the house, couldn’t figure it out, and then Joshua opened the larger of my two sliding-drawer-cabinets (not the one pictured above), and lo and behold, the brackets had given way and the whole thing had fallen. Thankfully, no dishes had broken, but the brackets needed some help. 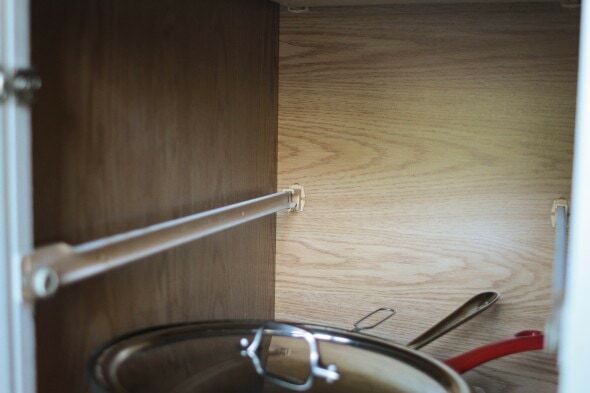 …..and after some googling, I discovered that our cabinets were made by Merillat, and that a lot of people have had trouble with these brackets breaking. I thought it would be simple to order a few new ones, but nope. Merillat stopped making these available, and the only solution they now offer is to order a whole new $15 sliding track system, which includes brackets. I slept on it, and in the morning, I decided to just press the easy button and order the new track system. But then when I started to check out, they tacked on another $10 for shipping, and that sent me over the edge. $25 when all I needed were two small plastic brackets?? I was pretty crabby about that, and I wrote a polite but unhappy email to the customer service person who’d informed me about Merillat’s fix. I left the Merillat site without buying anything and hopped in my car for a trip to the local hardware store. The guy there who helped me said, yup, that’s a unique bracket, and a one-size-fits-all replacement won’t work. So he took me to the plumbing aisle, handed me two hose clamps, and sent me on my way. Yup. The bottom of each bracket had separated, but not completely fallen off, so his idea was to clamp the bracket together and reinstall it. I wasn’t sure there would be room inside the cabinet for the clamps, but I tried it out, and there was indeed space. So I glued each bracket piece together with E6000 glue, and then tightened the hose clamp around the brackets. I let them dry for over 24 hours, just to be on the safe side, and then cautiously reinstalled them. In order for the drawer to shut all the way, I had to slide the hose clamps all the way to the back, which makes the bracket not quite as strong, but so far, they’re holding up fine. To be on the safe side, I rearranged my pots and pans a bit so that the drawer is holding less weight, and two weeks later, all is still well. I don’t know if this fix will hold up forever, but for the moment, I am deriving great satisfaction from not buying Merillat’s drawer track set. If these do give out, the next thing I’ll do is try these brackets, which I’ve read are a good replacement for the discontinued Merillat bracket. A pair only costs $3.50, so I feel like they’re a decent option. And they would still give me the satisfaction of not buying that kit from Merillat. Just to be clear, I’m not especially upset that my Merillat brackets broke. They’re fairly old, and that drawer had some pretty heavy Pyrex on it. What DOES upset me is that they’ve stopped making a small, inexpensive part available separately, and that they make you buy a whole new track set just to get two brackets. It’s such a waste of resources and money. Dear people of Merillat, if you ever see my post, hear this: I don’t want new tracks! I just want brackets. I know in the grand scheme of things, $25 is not the end of the world. And usually I don’t get hung up on the principle of the thing, but for whatever reason, I got seriously hung up on this one, and I’m pretty stubbornly set against ordering that kit from Merillat. I’ll keep you posted every so often to let you know if my clamped brackets are still holding on. Would you have been crabby about the $25 replacement kit? Or would you have just bought it anyway? P.S. I’m sure some of you are wondering why I didn’t just turn the brackets upside down. I did think of that immediately and I gave it a try, but the drawer wouldn’t close properly with upside down brackets. Oh well. We have been frustrated by several situations like that, or sort of like that. What bothers us the most is when the replacement part, the teeny-tiny replacement part costs a huge amount (Hey, order this replacement screw for $10!). Recently the plastic brackets that hold the shelves in our cupboards have been breaking and shelves crashing down. We are replacing them with metal brackets, but why, oh, why were plastic brackets used in the first place to support shelves that hold heavy and/or breakable objects? It just makes no sense because it’s not like the metal pieces would cost that much money in the first place. The plastic ones are maybe 1 cent cheaper, but when you sell thousands of these the cabinet maker decides to go cheap. I look for metal parts for any purchase, plastic always is not worth the slight savings. Even the tiny parts can ruin something, see comments below. I had a similar situation a few years back with a stroller. I had purchased it second hand, and after a few years of our wear and tear on it, I need to replace the axles on the rear wheels. Because it was an older model, the company wouldn’t sell me just the axle; they wanted me to buy an entire wheel! It was very frustrating, and customer service suggested purchasing a newer stroller (ha!). There ended up being some other bigger repairs that it needed too, so in the long run we finally tossed the stroller and went with a different brand for a replacement. We’ve had loads of plastic thingamigigies also malfunction in various household goods. As a rule, we buy slightly above midrange-cost appliances, etc. with the idea that a little better quality pays off in the long run. I am not sure it does! I wonder if the very high end goods are MUCH better constructed, with less plastic parts and subsequent breakage. ? This is similar to our purchasing philosophy. We buy the most expensive basic model. So the most expensive appliance with the least bells and whistles. 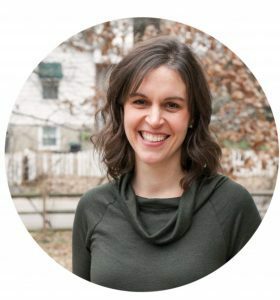 Fewer bells and whistles usually mean fewer things to break and the cost usually indicates quality as opposed to additional features that you probably didn’t know you needed until the manufacturer told you so. This is what I’d do if I were buying a new washing machine! I’d be looking for something without a bunch of fancy features…the simpler, the better. I love that my washing machine just has knobs…nothing is computerized at all, which means it’s possible to affordably fix almost anything that goes wrong with it. Unfortunately a lot of professionals will refer to what you did as a “cob job” because you didn’t buy the proper part and repair it in the proper way. I think you have the proper response to that which is that it’s simply not available to you. It’d be great if you had the ability to 3D print new brackets but my instinct is that they wouldn’t be strong enough. I disagree about 3D printing not being a viable option. The materials are getting better all the time, and there are now websites and stores that will print your part for you. I think even Amazon is experimenting with that idea. 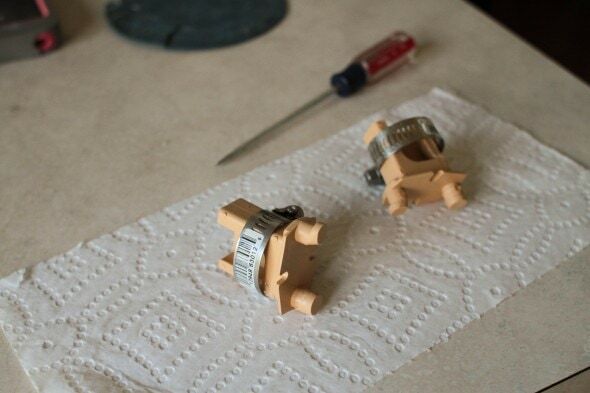 If you can create a model of the part I think it’s worth a try. I was just remarking to Hubby recently that it seems like things are made to give out fairly soon (even 10 years is soon in the life of a house) and his take is that things are purposely made so you wil need to replace them eventually. 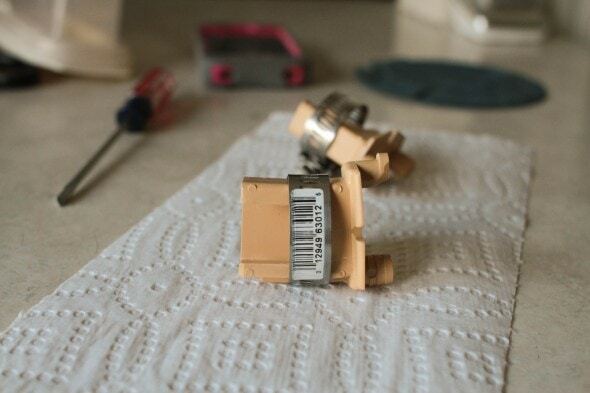 In the last couple of weeks, I’ve had several things fail: an iron, blow dryer, the engine on a 8 year old car, my 7 year old dishwasher…it makes me crabby, too. And the cart thing is hilarious – that happens to me, too! Yes, this! Our house is 16 years old and our windows need replacing already. We are not alone either, several houses in our neighborhood are in the same boat or had to replace a few years ago even. Windows are so expensive, I think they should have to last at least 20 years. I just bought my first house in March of this year….and the windows were all original. (House built in 1958). They’re wood, and surprisingly double-paned. But they all need to be replaced pretty badly. This spring I plan on replacing the last 8 in one fell swoop…but I doubt the ones Im replacing them with are anything close to the original quality…. Puh-leeeeze look into repairing them before you replace them with new “plastic” windows. The manufacturers of new want you to buy more, not fix what you have. YouTube and the world wide web are your friends. When it comes to fixing things, somebody, somewhere has figured it out. The high end oven in our it-came-with-the-only-seven-year-old-house stove/oven combo went out the week before our annual Christmas Cookie Party. DH had to order parts twice ($400, gah!) to get a complete fix. He had to dismantle the front panel and remove the entire top of the stove to get access. He finally found a “secret” panel that gave him the access he needed to do the repair. I say “secret” because it was shown on none of the company’s schematics for the unit, not even the parts list. In searching for answers, we found several like ours for sale. People were selling their $7500 stoves for pennies on the dollar because they “didn’t work”. I realize that in this case, the answer literally wasn’t there, but DH did find enough clues to eventually figure it out. I’ll take $400 oop over $7500 (that’s $8175 with tax) every darn day. Really, who needs such an expensive stove? If you can figure out how to repair/refurbish your existing windows, Reese, you will be looking at a similar payback. Absolutely worth the effort. Check with your local Ace, or other source for just replacement double pane glass – already made in one piece and sealed for long term success. If you are handy, there are online videos for the steps needed. I have best success at easy install by using strong double side tape around the entire edge, then I make my own stop using a table saw and router. Cost per window $60 on my nice casement wooden windows, the local glass store wanted $160 for the exact same glass piece, and to hire it would take $20,000 from Lowes to replace entire frames with cheaper plastic ones. I do a few at a time, and occasionally break one during install. Still far better way to go. It’s called planned obsolescence, they are made to break down so you have to buy more. And that’s how I felt at first, but for some reason, the $10 shipping charge just pushed me into, “I can’t.” territory! I know it doesn’t necessarily make logical sense, and I don’t normally get hung up on the principle of things, but in this case, I just am being really stubborn. 2. I’m too lazy to change Reason Number 1!! But good for you, I wish I was more like you in this department. Would save me a lot of money and maybe give me some sense of pride about being able to fix things. Planned obsolescence stinks and makes companies lots of money. It also makes them lots of angry customers but my experience is that they don’t care! Yay for you for at least winning this round. And yay for the hardware store guy too for suggesting a cheap fix. I really don’t appreciate hidden costs, and I would have probably gotten annoyed when that $10 shipping add-on showed up, too. And I really hate planned obsolescence. Funny story about “the principle of the thing:” my husband recently got annoyed because a store-brand product that we have used for years just decreased its size by 1/3 (used to be six ounces, now it’s 4) but kept the same price, and so he left the store without buying the product. Trouble is, the non-store-branded product that he bought elsewhere costs four times as much as the reduced-size product. While I am enjoying the pricier stuff (it smells nicer), I’ll be returning to the now-more-expensive-but-still-cheaper kind just as soon as he cools off! I wouldn’t buy it. I’m stubborn that way. In fact, it would be more likely I would go and whittle a replacement out of wood! I think companies who charge $15 so they can fix a problem with things they have sold are simply price gouging the customer. I say good for the guy at the hardware store. And good for you! I hope you never have to give in to this absurd theft! I probably would’ve bought the $15 tracks without hesitation but NOT with the added shipping. Shipping charges irrationally annoy me, particularly when they are already up-charging you. $5 shipping for the $3 brackets…OK fine it does cost money to ship things, but if you are making me pay $15 to begin with, I’m calling customer service to complain and heading to the hardware store! Lucky the guy at the hardware store was able to help you hack it! Otherwise, you might not have had a choice but to fork over the $25. We live in a throw-away society. For that price you can almost purchase another shelf that holds more weight. I purchased several from Costco. 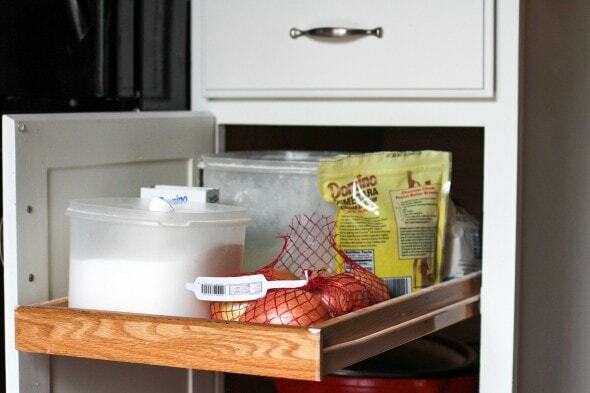 They are metal, smooth rolling guides, perfect for not bending down into my cabinets for things way in the back. Love them! I would love these – what brand are they? I’m hoping that my Costco has them! Yes yes yes! And I’m sure I wouldn’t have been nearly as polite as you were! But awesome fix — you outfoxed ’em and I hope they read your post. I like the way your hardware store guy thinks. It’s how my hubby thinks. It is not how I think. We have been trying to get our bathroom sink handles to stop leaking for a year and a half. My husband keeps “fixing” them. The other day I couldn’t get the water to turn off. It is now time to call the plumber, but at least we tried! There actually may be a point to their decision, though. They may have decided to stop making the brackets because they break often, and the new tracks may just be what is needed for the new brackets. In this case it would be a matter of listening to consumer complaints and fixing the problem. If that’s the case, then I would understand and I’d buy the new tracks. But if that was the reasoning, you’d think the customer service person would have explained that to me in her email or something. There are lots of angry Merillat customers out there over this issue, so they’d soothe a lot of unhappy people if they explained something like that. OOOOOOH Kristen. You sound just like me! I’m only smiling about your post because this happened to me two weeks ago. When I first bought my house in March, it had wall-to-wall carpeting from 1990. Doesn’t sound that old, but dang that was 25 years ago! And it smelled :/ I could only afford a fixer-upper, but until I could afford to buy the replacement flooring, I had to live with the carpeting. With a dog…and two cats… well a spot cleaner would be helpful! So I bought a portable carpet shampooer from Bissell. I used it once out in my car to clean up the seats. It was AMAZING! My car was sparkling! I cleaned out the hoses, stuck them in my laundry room, and called it a day until I needed them for carpet. The day came. Dog. Upset tummy. I’ll spare you the rest. But when I used it again, the dirty water sprayed every which way from the hose. I couldn’t find a hole, but it was spraying from where the hose attached to the inside of the shampooer. Ok. No big. I’ll replace the hose! (maybe an ornery orange cat I own who shall not be named gnawed on it). Searched online…no dice. Called Bissell. They said it was considered an internal part because it hooked up on the inside. I had to get it from an authorized dealer. I contacted the local company they gave…. The part was $40. The labor to install it was $45! THE WHOLE DARN THING COST $100 BRAND NEW. I complained to Bissell’s customer service. They gave me a 20% off coupon to buy a new one. I can’t believe they wouldn’t cover that under a warranty. That’s so lousy. I had (actually still have ) a Kenmore vacuum I paid $125 for in 1999. The little plastic piece that holds the roller in place snapped after just over a year, when it was just out of warranty. I lived in a 200 sq. foot studio at the time so its not like it was getting a ton of use. I went back to Sears thinking they would have the part. The sales person said I had to order mail order it. And of course I couldn’t just get the plastic piece. I had to get the whole roller. With shipping, it cost $57 to fix. I was super annoyed at the time, but the replacement piece has lasted 15 years so I can’t complain too much. My lame plastic refrigerator handles have to be replaced each year though. They crack and snap on a regular basis. Aggravating! Seriously good for you. Too often we just accept this kind of thing and companies assume they can do whatever they like, charge whatever they like. It’s good to see someone take a stand. We have taken on several projects this past summer that required a bit of engineering know-how. I can’t thank the people at Home Depot and Lowes enough for their ingenuity! Several of them have come up with ideas that saved us LOTS of time and money. Along the lines of your little plastic thingys breaking. Our neighbor had a similar issue with a plastic connection. The water connection under one of their bathroom sinks has a plastic nut on a metal braided flexible pipe. The pipe will NEVER break but the plastic nut cracked just ever so slightly and the whole thing slipped off and water gushed into the house – in the middle of the night. New carpet and padding and all plastic nuts changed to metal cost them a pretty penny! Ohh, what an awful thing that happened to your neighbors. So much frustration. I would have done the same thing! Poor customer service (which is what this seems to boil down to) is a huge reason for me to avoid a company! This makes me itch to rearrange my cabinet. I have Merillat as well, with the same sliding shelves. I’m very thankful for them because I store my pots/pans/pyrex on them and it would be so annoying to have to get down on my knees to search through a shelf. But I have my pans collection on the top and pyrex on the bottom. I forsee some reorganizing in my future. My pots were actually less heavy than my multiple stacked pyrex dishes, so I now have my two pots on the sliding shelf, along with my small pyrex pieces. The heavy glass bowls and such are on a fixed shelf now. I would also have been ticked. And, you need to remember that guy at the home improvement store….he’s my kind of guy! I had a similar situation with a horn on a truck. It would randomly go off, and sometimes kill the battery. The dealership said I needed to replace the horn, which would require popping the airbag….estimated cost of at least $3K. A friend recommended a mechanic. He rerouted the horn to a toggle switch on the side of the steering wheel….$7. He has now been our family mechanic for at least 15 years. I think many companies make most of their money by nickel and diming their customers. A little here and there which the customer may or may not notice multiplied by every customer…the reduced sizes of cans of food so the price stays the same but the quantity is decreased…did they really think I wouldn’t notice the ice cream is no longer a true 1/2 gallon?! Anyway, sometimes we have no choice but I totally get the feeling of the last straw. Glad you found a solution! I know lots of folks who are into crafts love E6000 glue, but there are “engineering” glues which would have been more appropriate. They would have cost more due initial buy-in, but if you do lots of plastic repair and the part is structural (as these brackets are), I’d suggest you add this to your arsenal. The above items run around $40 as of this writing. This sounds expensive, but it is frugal in my opinion because of how successful the repairs have been and how many uses you get out of a cartridge. Only the nozzles and cartridge are consumables — the cartridge gun is like a caulk gun and can be re-used. Note that this adhesive must be used outside or while wearing a respirator — it is strong-smelling stuff while curing! Oh, good to know! We had it in the house because my girls are into crafty stuff, so that’s why I used it. I’d never heard of the kind of glue you mentioned, but I totally agree that something like that can be frugal if you do a lot of repairs. Things like that happens all the time now. Nothing is made to last…on purpose! I’m sure unscrupulous companies do this for the extra money, because less and less people have the ability to fix anything themselves and yes they do shell out the bucks because they don’t think they have a choice. YES, it does tick me off, too. You are not alone. Not to be on Merillat’s side, but it IS possible they realized they had an issue with the brackets and made modifications to the design, so it’s isn’t that they no longer sell the brackets, but that their new design brackets only work as a set with the drawers. This happened to us with a washing machine. The company re-designed their product (in a way that was imperceptible to most consumers) and discontinued the old part (so you have to purchase the whole wringing unit to get the base). I did think of that, but based on my reading online, the old tracks work just fine with the new brackets. People order the set, install only the brackets, and they’re good to go. Bummer about your washing machine! … and you didn’t need whiskers to fix it!! Although I did need the whiskers at the hardware store. Heh. I’m with you. I’d be ticked too. This kind of thing is aggravating to me from an environmental point of view. New materials are used to needlessly produce replacement parts. Perfectly usable material (the broken item) ends up in the landfill for no good reason. As for reducing quantity rather than raise prices. I’d rather pay a higher price because of the increased packaging. I’m so glad to hear other folks concerned with planned obsolescence. I live in Silicon Valley (the heart of Apple and planned obsolescence). I am practically shunned when people hear my cell phone is 2 years old. I’m glad you found a better solution than overpaying for shipping *and* that the person at the hardware store was so helpful! Win! We often refer to your hardware guy’s method of thinking as “Amish engineering”! It’s a great way to think! That’s so very frustrating when stuff like this happens. Something really simple rusted out in the back of my relatively new fridge, causing an annoying leak, and the part was obsolete! So I just rolled up a towel under the fridge door until we ended up replacing the fridge (which cooled just fine!) with one from our newly acquired rental property. Grrrr! Don’t you hate that, when you praise something only to have it fail you for the first time immediately afterward? I probably would have been crabby about that scenario too. But I feel like I’ve been in a lot of similar scenarios lately….Grrr…. My expert says that a 3D printed part would hold up well. If only I had a 3d printer! My library has two. 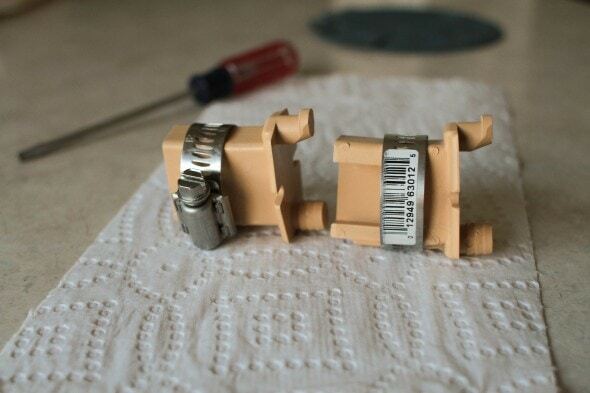 They bought two because if one breaks, they can print the replacement part with the other one. Sweet! Ok, not to be a pain…is it possible that they changed the design because of the clip problems? People are so sue happy these days that they might not be able to sell them to you anymore. This happened with my blinds. I’m so used to free shipping with Amazon Prime that $10 is hard to swallow. (Amazon is losing money on their free/low shipping charges). S&H might actually cost that much if they are paying livable wages to their employees. I love having a creative and helpful hardware store in my neighborhood! They have helped me creatively fix many, many different things. I LOVE your home repair posts and your phrase about it not taking wiskers! Well, that did occur to me, but even if that were the case, I see no reason that they can’t sell the new clips separately. The ones that come with the set work with the existing drawer slides, so people are buying the kit, using only the brackets, and ending up with slides they don’t need. So I just don’t understand why they aren’t making the new brackets available separately. Good point. I hope that your “new” ones work for a long time! If you lived in Alaska, they have added on the 10 plus another 24 or more for sending to Alaska—even though when it arrived, the postmark would show that it cost less than the first $10 they charged. I stick to places like LL Bean, where they don’t penalize Alaskans. That would be frustrating! I guess you have to really consider whether it’s worth it to shop online in cases like that. What a genius fix! You did the right thing! We own a custom cabinet manufacturing company and I have to tell you we would have warrantied a break like that even many years later. Your repair was alright however since the rear drawer guide clip has broken once it suggests the pull out shelf was loaded heavier than the hardware can handle. It would work better for you and be stronger if you would replaces the hardware with full extension slides. The full extension slide would be good for a hundred pounds of contents and the pull out shelf would completely pull out of the cabinet giving you better access to the shelf. 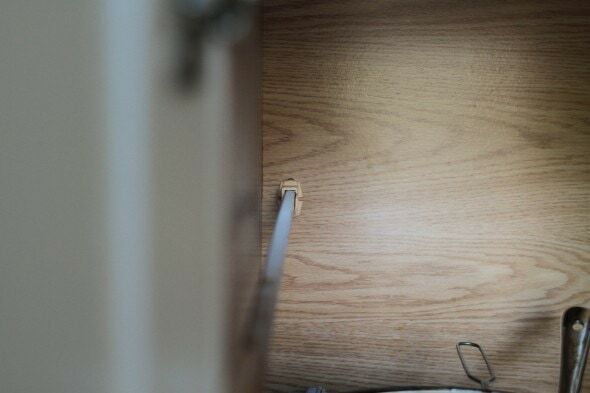 If you don’t want to change the slides I would suggest you cut a piece of wood the same thickness as the space between the slide and the side of the cabinet and glue and screw it to the side of the cabinet. You could then screw the slide directly to the side of the cabinet. This would take the stress off the plastic clip already prone to break. 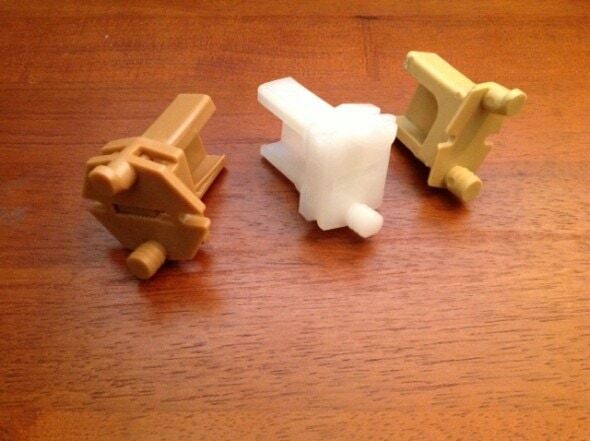 If you need to replace the rear clips you might try woodworkershardware.com They have rear clips for several different brands of roller slides. Yes it would bother me. 25$ is a lot for us. You people are way too stingy. Think about all the steps and people that it would have taken for those brackets or whatever you other folks are griping about, to get in your hands. Not to mention that the company has to stock a solution for your problem. My dear aunt used to say ‘ money is made round to go round’. This idea that the big bad corporation is out to get us is silly. No one is out to ‘get you’. They are just trying to survive. Well, the thing is, I totally do not mind paying a fair price for a bracket. Lots of companies sell brackets individually and I assume they’re charging a fair price for them. But no one else is charging $25 for a pair of shipped brackets, you know? That was my hang-up. Merillat is already manufacturing the brackets, they’re just not selling them individually. Instead, they’re packaging them with drawer glides. There are some good corporations out there and there are some shady ones, and there are good practices and shady practices within companies. I’m not painting them all with the same brush, and (you can ask my husband) I’m prone to assume the best of people and companies, to a fault. However, I feel unhappy with the way Merillat has chosen to handle this bracket issue, and I’m not the only one. Some other customers have had 20 sets break. Imagine having to buy that many sets of glides and brackets! It would be insanely expensive. Anyhoo, I think Merillat could handle this situation in a way that would be far more customer-friendly than their current method, and I think it would be awesome if someone there would listen to all the unhappy customers with broken brackets and bring about some change. It pissed me off to when I saw that after shipping the replacement package doubled to $40. No wonder they don’t make the replacement plastic part – it is like being held hostage. Companies make things on purpose these days so eventually they will break and then charge and arm and a leg to replace it. Things aren’t made they were years ago but I think part of that is customer fault – they don’t want to pay the type of money would have to for something that will last. There is someone online who used a 3 D printer. The part isn’t an exact copy but is giving away his pattern. I think the reason these parts are failing is not just weight but that eventually plastic dries out then fails. Any way. I am going to try the part you suggested that others have used. If it works I am going to order more and replace them all while there is something to replace them with. I just did the same thing: I was set to order replacement brackets, but when the shipping cost came up, I balked at it. That is how I happened upon your site. I love this fix, and I am going to try it. Thanks so much for sharing! awesome idea. I ended up using zip-ties, no as strong, but should still do the job. Kristen…I’d love to hear your your McGyver clips held up. I’ve already about one set of drawer slides and now need 2 more. Like you I’m not against paying the money but if I don’t have to all the better. I’d love to hear updates. So far, they’re holding up just fine! Two thumbs up. You know, that’s a very smart idea! Better to prevent breakage than to fix it.